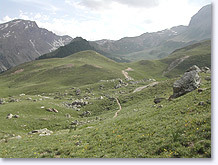 The Guillestre area is at the convergence of several valleys, including the Guil valley. At its centre is the town of Guillestre, surrounded by peaks more than 3000 metres high, and traversed by the mythical Great Alps Road. This area has a remarkable cultural heritage (the Mont-Dauphin fort), and natural heritage (the Queyras Regional Natural Park). There are internationally renowned ski resorts at Vars - where many speed records have been broken - and Risoul, which is now a popular resort with snowboarders. Together these two resorts form the vast skiing area of La Forêt Blanche. The natural curiosities not to be missed include the Petrifying Fountain of Réotier, where the water at 22° creates strange calcareous concretions, Col de Vars (2108 m) on the Great Alps Road, and the Nature Reserve at Val d'Escrein. 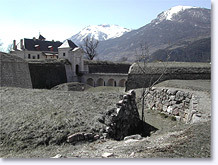 As for architectural heritage, the area boasts the fortress of Mont-Dauphin, which is a Vauban masterpiece, and the church of Notre-Dame d'Aquilon at Guillestre, a 16th century masterpiece !